Humans can live on Earth for decades. However, when human life on the planet Psc b GU, our age not until a day! Why? GU Psc b is a planet that orbits its star at a distance that is super far, 2,000 times the Earth-Sun distance, or around 300 billion kilometers. Due to long distances, the time taken by the planet to orbit its star, GU Psc, much longer. A year on the same planet with 80,000 years on Earth. GU Psc and GU Psc b are the stars and planets were discovered by Marie-Eve Naud, a doctoral student from the University of Montreal in Canada. Naud make observations on the star cluster named AB Doradus, which consists of a cluster of stars 100 million years old and moving clumped together. Observations were made at Observatoire Mont-Megantic. The results of the study published in The Astrophysical Journal. 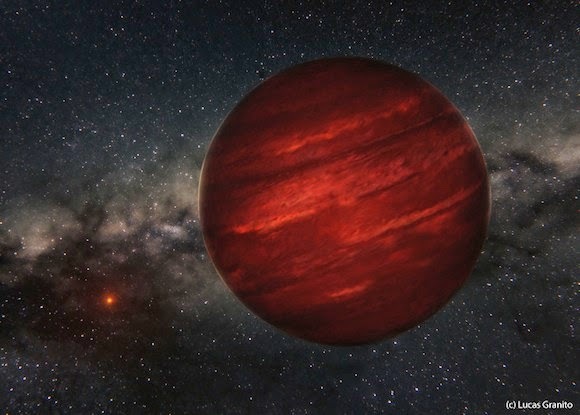 GU Psc b is a giant gas planet, measuring 9-13 times that of Jupiter. So, size is much larger than Earth. Rene Doyon, director of the Observatoire Mont-Megantic, was quoted as IFLScience.com, revealed, "GU b Psc is truly a gift of nature." With distance away from the super star, the planet can be observed with a variety of instruments that enable scientists to understand more about the giant gas planet. Meanwhile, Etiene Artigau, one of Naud supervisors, saying, "This planet is a rarity in planetary systems." He shared a number of students and colleagues looked at more than 90 stars and found only one planet.